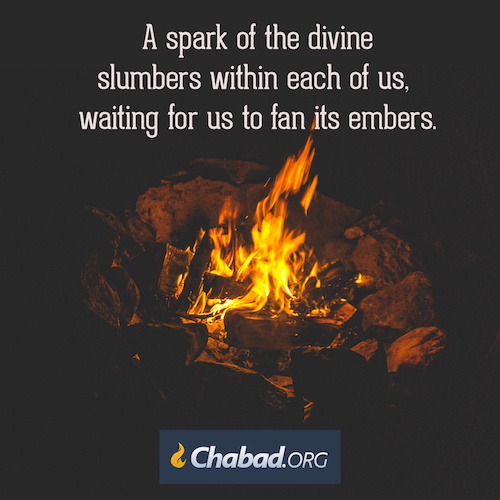 A spark of G‑d slumbers within, as a flame hushed within the embers. Will she awaken from ideas? They are only more dreams to sleep by. Will she awaken from deep thoughts? She is smothered yet deeper within the ashes. She will awaken when she sees her Beloved, the One Above with Whom she is one. And where will she see Him? Not in ideas, not in deep thoughts, but in a G‑dly deed that she will do, in an act of infinite beauty. Then her flame will burn bright.